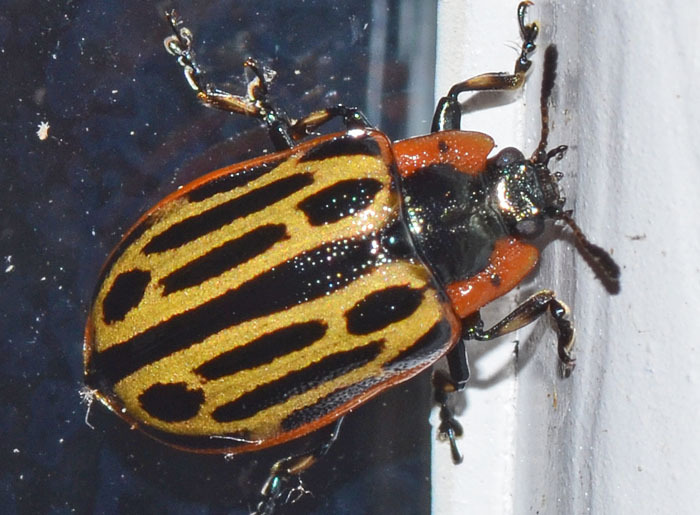 Chrysomela scripta (Cottonwood Leaf Beetle). Size: approx. 7 mm. Photo: 04/22/15, 10 pm. The Cottonwood Leaf Beetle feeds on willows and poplars. I understand that the term 'cottonwood' refers to certain types of poplars. The larvae skeletonize leaves, whereas the adults feed on large veins. It can cause extensive leaf loss which subsequently reduces stem volume up to 70%. In earlier times, this common beetle was considered a pest because willows were grown commercially for baskets.